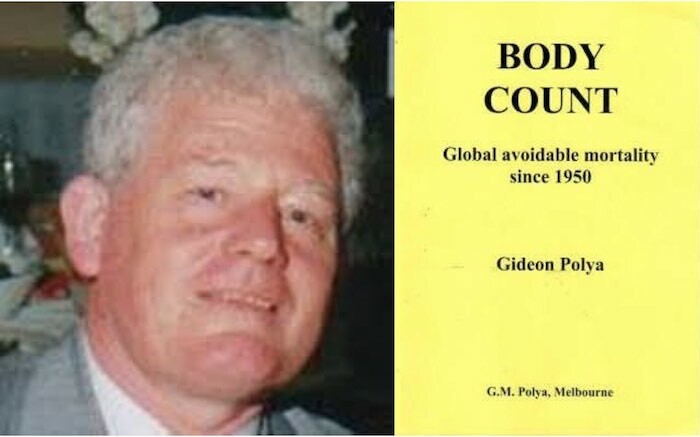 Dr. Gideon Polya, a leading scholar of holocausts and genocides, is the author of Body Count: Global Avoidable Mortality since 1950. In this interview he describes how as a science professor he came to realize the importance of avoidable mortality—and discovered that mainstream institutions are censoring this critically important but embarrassing information. The majority of holocausts and genocides, such as the five-million-victim British-perpetrated Bengal famine of World War II…not to mention the 27-million-Muslim 9/11-wars holocaust…are almost completely unknown to Western populations and the the media that misinform them. (A) some years ago I generated a website called “Muslim Holocaust Muslim Genocide” that succinctly sets out the awful violent deaths (where ascertainable) and huge avoidable mortality from deprivation associated with atrocities from the ongoing Afghan Genocide to the Yemeni Genocide. However if you Google “Muslim Holocaust Muslim Genocide” the website does not appear in the initial 7 pages of 68 results, and when I the click the link for results Google says it has “omitted”, my website comes up as number 3 on page 2 of this now inclusive search. Note that 95% of Google searches give up after page1. In contrast, if you do a Bing Search for “Muslim Holocaust Muslim Genocide” this website per se comes up as number 2 on page 1 of 1,930,000 results. (B) Similarly, years ago I created a website called “Jews Against Racist Zionism” that provides a regularly-updated and alphabetically-organized compendium of the humane opinions of eminent anti-racist Jews opposed to racist Zionism, from Hannah Arendt to Howard Zinn. However if you do a Google Search for “Jews Against Racist Zionism” the website does not appear in the initial 11 pages of 102 results, and when I the click the link for results Google says it has “omitted”, my website comes up as number 5 on page 2 of 5,570 results. In contrast, if you do a Bing Search for “Jews Against Racist Zionism” this website comes up as number 1 on page 1 of 2,300,000 results. Zionist-dominated Google is involved in egregious censorship. “Iraqi Holocaust Iraqi Genocide”: https://sites.google.com/site/iraqiholocaustiraqigenocide/ . “Muslim Holocaust Muslim Genocide”: https://sites.google.com/site/muslimholocaustmuslimgenocide/ . Gideon Polya, “Paris Atrocity Context: 27 Million Muslim Avoidable Deaths From Imposed Deprivation In 20 Countries Violated By US Alliance Since 9-11”, Countercurrents, 22 November, 2015: https://countercurrents.org/polya221115.htm . “Afghan Holocaust, Afghan Genocide”: http://sites.google.com/site/afghanholocaustafghangenocide/ . No doubt you are aware of the horrendous Christchurch Massacre in New Zealand (50 Muslims at prayer killed, 50 wounded by a gun-toting White Supremacist). The ABC (Australia’s equivalent of the UK BBC) invited 5 Muslim Australian women (all professional, 4/5 wearing the hijab) to comment on a program called The Drum and they all essentially said the same thing – they were appalled and distressed but not shocked because in their view Australia as a whole had been violently White Supremacist since British invasion in 1788, and is still participating in killing millions of Muslims abroad in the War on Terror and with rampant Islamophobia at home that particularly targets women (they are readily identifiable with the hijab and are vulnerable). This is what I have been saying for 2 decades but not what Australians have been hearing thanks to massive media censorship (I and like humanitarians have been made “invisible” in Australia over the last decade) and massive self-censorship (they don’t want to know). They cited Yassmin Abdel-Magied (female, Muslim, African, engineer, journalist, forthright – ticked all boxes for upsetting White Supremacists) who on Anzac Day (Australia’s war dead memorial day) put a mere 7 words on her personal social media: “Lest we forget: Syria, Palestine, Manus , Nauru” and elicited massive national outrage, lost her ABC TV program and left the country; see Gideon Polya, “Yassmin Abdel-Magied censored on Anzac day – jingoists trash Australian free speech”, Countercurrents, 28 April 2017: https://countercurrents.org/2017/04/28/yassmin-abdel-magied-censored-on-anzac-day-jingoists-trash-australian-free-speech/ , ) These forthright Muslim women answered my endless question: am I mad or is the world mad? This show was broadcast on March 27, 2019. This entry was posted on Tuesday, March 26th, 2019 at 5:48 pm	and is filed under 9/11, Education, False Flag/Fake Terror, Human Rights, Justice, Kevin Barrett, Mass Shootings, News, Protest. You can follow any responses to this entry through the RSS 2.0 feed.